Sargent is a Tribal Vocational Rehabilitation Administrator for the Kodiak Area Native Association, TAY’s chief sponsor, which partnered with the Koniag Education Foundation, Kodiak Island Borough School District, the Kodiak Library, Kodiak College and other partners in preparing the event. The CMP grant effort teams up with teachers, administrators, family and other community members who coach, encourage and referee students as they prepare for life beyond high school. TAY is an acronym for Transition Age Youth. 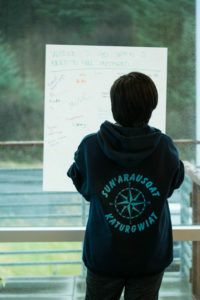 This year’s conference—in Alutiiq, Sun’arausqat Katurgwiat (The Young People’s Gathering Place)— took place October 24‐28. This year’s conference kicked off on Tuesday with an engaging video of Alaska Native students at the University of Alaska Southeast and Haskell University, discussing why they decided to go to college, what challenges they faced and what was required of them. Student comments sparked a lively discussion on challenges, sources of help and educational opportunities. These concerns, which fit into the CMP grant objectives, were explored during the following days. On Wednesday morning, workshop facilitator Lena Jacobs engaged participants in several activities, including one in which they wrote down long and short-term goals, steps they planned to take in order to achieve them and a list of sources who would help them achieve those goals. Afterwards, participants were paired up to discuss their responses. The activity challenged participants to give voice and written word to their own goals and helped them to see that others, regardless of age, also strive to make their goals reachable. 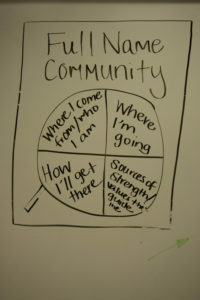 In another session, Jacobs had students write a personal essay in which they addressed personal and family histories, educational, professional and life goals, cultural connections, volunteerism and the role the community plays in their lives. This exercise helped students organize their thoughts and precipitated meaningful conversations in table discussions. Finally, students engaged in a practical exercise, completing a mock scholarship application. 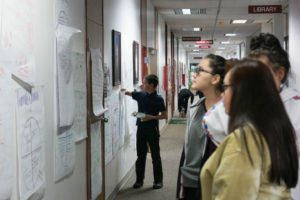 The five-day conference also included a financial reality fair, a future-ready exploratory lab for middle schoolers at the Kodiak Library; creation of an eportfolio and job-shadowing. TAY culminated in a college and career fair at Kodiak High School where vendors informed students of the availability of scholarships and financial aid, post‐secondary education, internships, employment and military opportunities. Cultural appreciation and awareness were woven into the rich tapestry of activities. The opening ceremony began with the lighting of the Alutiiq lamp. 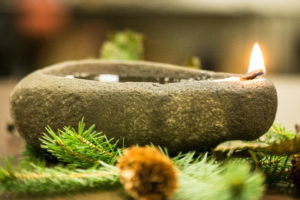 At the close of the first day, keynote speaker, Dr. David Baines – a member of the Tlingit and Tsimshian tribes of Alaska— discussed how he incorporates his traditional beliefs into his medical practice. Students made Alutiiq masks, listened to a lecture, presented by the Alutiiq Museum, about the meaning of Talking Rocks and engaged in friendly competition through Native Youth Olympic activities. Conference “participants were offered a wide range of valuable programs,” said Mike Stoesz, Old Harbor K-2 teacher and chaperone. “Rural kids had an opportunity to spend time in their peer group. It was great to see them laughing and joking with each other. “The essay writing practice (sponsored by KEF) was great. When young people are thinking about their future … it’s a positive thing,” said Stoesz. Committed to improving student academic outcomes, teacher retention, and advisory school board and family involvement, KEF looks forward to bringing the Community Mentorship Project workshops to future TAY conferences as well as other events. The Community Mentorship Project is made possible through a three‐year grant KEF received in 2016 from the U.S. Department of Education Alaska Native Education Program (ANEP). 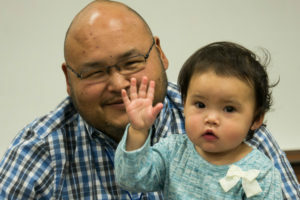 The TAY conference was made possible by grants from the US Department of Education Alaska Native Education Program, the Alaska Mental Health Trust Authority and other entities.